Like every other Cubs fan in Chicagoland and beyond, I've been on cloud nine since they won the World Series. I still am having a hard time wrapping my head around the idea that they are actually the World Champions - 108 years after their last world championship title. 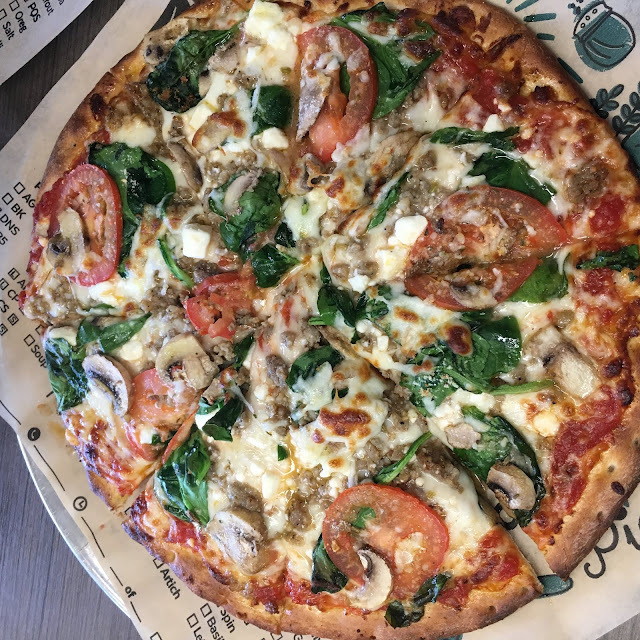 Last month we were honored and excited to be invited to share in a joint celebration at Olive Theory Pizzeria in Downers Grove to celebrate the 5th anniversary of our blog and the 1st anniversary of their restaurant. They invited us in before the party to get a behind-the-scene look at how things operate and to do some sampling. We even got a chance to create our own pizza recipe and it was served at the anniversary party. After a little experimenting, we came up with our signature pizza - made with a regular crust brushed with garlic pesto and classic red sauce, then topped with mozzarella, provolone and feta with sausage and mushroom, baby spinach and tomato and then drizzled with garlic olive oil and sprinted with Posiedon's Blessing seasoning blend. It was pretty delicious. They asked us to name it - and at the time, the Cubs were in the playoffs and fighting to get to past the National League Championship Series. It only seemed appropriate to name our pizza "The Big W." The night before the anniversary party the Cubs won the NLCS and advanced to the World Series for the first time since 1945. I like to think maybe we gave them a boost of good luck. It's been 11 days since they won the World Series and I still can't believe it. And I'm still basking in that glow that was 108 years in the making. If you want to join us in our celebrating - of our blog anniversary and Olive Theory's anniversary and the Big W of our beloved Cubs, stop in and ask them to make you a "Big W" pizza. We hope you love it as much as we did. And if you stop in and try it, drop us a note and let us know what you think!